Circular swingmill blades perform similarly to those on fixed site circle mills or portable double-bladed mills, but are very different technology to bandsaw blades. There is a neat story about how this was discovered. Prior to the first swingblade portable mill, most circle blades usually had 20-40 teeth or more on them. Back in 1988 when Mr Peterson build the first ever portable swingblade mill, he demonstrated the prototype at a local fair with a blade that had 16 teeth on it. Being a bit nervous with a crowd gathering, Mr Peterson pushed the mill too hard and a portion of the guard came in contact with the blade. The ‘clang’ drew even more people so he acted like it was no big deal, quickly tied the guard back on, and carried on milling. Mr Peterson was pleasantly surprised how easy it was, as board after board just peeled off that log. The crowds stayed all day watching in awe. When the people finally moved on, Mr Peterson took the guard off to sharpen the blade. He was amazed to discover only 4 of the 16 teeth were left on the blade! Most of the teeth had been taken off by the guard. The rest is history. Most swingmill blades today have between 5-10 teeth on them. There is a fine line between hp, speed of cut, depth of cut, finish quality, and even density of timber, to arrive at the perfect number of teeth. When you chip a tooth or lose one of the tips on your swingblade, you can usually just carry on milling until the end of your job, or at least to the end of the day. It’s fairly cheap to get a new one welded on, but it depends on your schedule as to when you chose to do that. Very few millers want to stop in the middle of a job. You may lose a tooth when you hit a nail or stone, or going too fast through a dead knot. The broken-off tooth piece will then hit the tooth behind it, chipping a smaller piece off that tooth. You will usually see two tips damaged in a row; the first one almost completely gone, and the second one chipped as shown in the pictures. One or two chipped teeth won’t cause too much problem; you might just saw a bit slower and it will be a bit harder to push. But the boards will still be true and the finish will be fine. Complete your day on the job at least. Here an owner has continued to use his blade for several days with an entire tip missing. 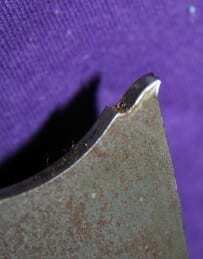 There is no tungsten left at all, so nothing is protecting the blade steel from damage. The tooth seat begins to wear and bend back as shown in the picture. To repair this, the sawdoctor will have to file down the raised bit and put more steel into the seat to build it back up again. Maybe $20 extra to repair a seat. Here is a picture of a seat that was not quite repaired correctly. You can see there is not much steel supporting the upper back of the tip. But you will be surprised how long this will last still. There’s good solder holding it on, and you should still get a full run out of this tip. When you do need to get your tooth seats fully built-up again, expect to wait for a couple extra days to get your blade back. If the tooth is entirely gone leaving a clean seat, it is most likely that the sawdoctor did not put enough heat into the soldering process. If there is a thin sliver of the tooth left, it is very likely that the sawdoctor put too much heat into the soldering process, creating a hairline fracture in the tooth. NB: A board foot is 12” x 1” x 12” long. A cubic metre is 1m x 1m x 1m, or about 424 board feet. You will need to sharpen your blade about every 400 board feet or every cubic metre of sawn timber, or a bit earlier on grit or sandy bark. You should take the top off the log first (with all the grit in it), and then sharpen your blade once you start to get into clean timber. Most swingblade sawmill manufacturers provide 12V sharpeners with their mills, included in the price of the mill. This is one that is run off the mill battery, and sharpens the blade while it is still on the mill. This sharpener is fitted to a jig, which sits on the blade against the collar. A diamond wheel must be used for sharpening tungsten, which is attached to the sharpener head and swivelled up and down against the face of the tip by hand. You’ve got to make sure the face is covered evenly, so you match the hook angles. This jig can be adjusted to follow the hook angle (if not already set). Each tip takes about 10 seconds to do, so the whole blade takes about 4-5 minutes. For a full days milling, you might sharpen 3-4 times a day. That’s a total sharpening time of 15-20 minutes per day, cutting 4-5 cubes or 2000bf. Some millers prefer to work harder and longer, and only sharpen once to twice a day. After a few weeks of serious milling, the tips will get thinner as you sharpen them down. 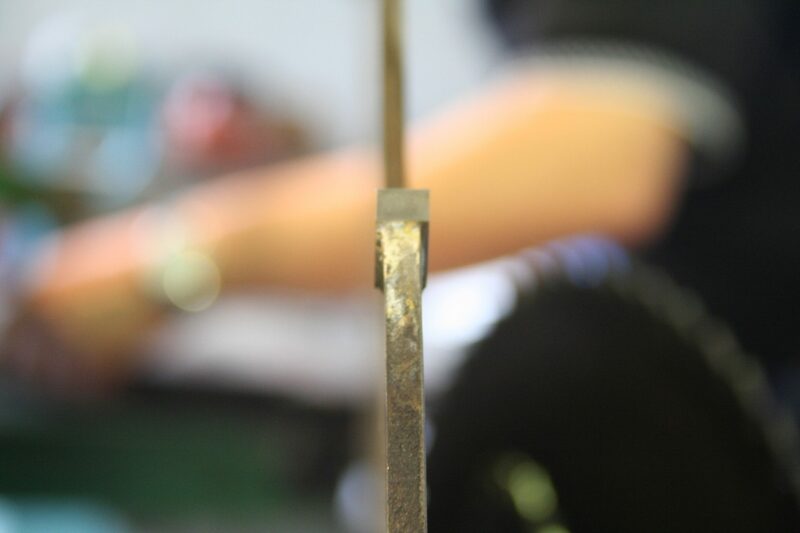 A tip can be used down to about ¼ of it original thickness, or about 1.5mm or 3/64th of an inch thick. Assuming you don’t hit any metal, a set of tips on a swingblade will last about 17,000 board feet, or 40 cubic metres of sawn timber. 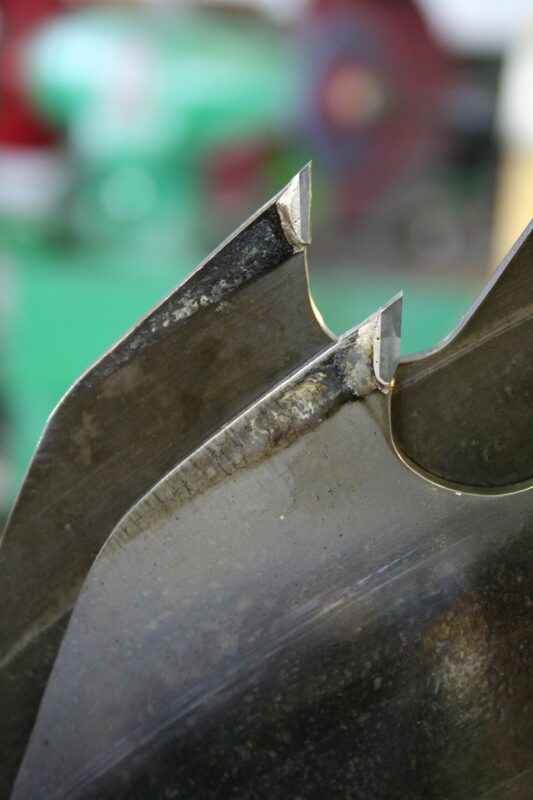 To get a blade fully retipped, you will pay anywhere from $30-$70 depending on your sawdoctor’s rates. the blade’s performance on the mill, and give your sawdoctor some feedback. He might not get it perfect for you the first time ‘round, so he does need to know what to change to get it just right. And once you gain confidence in your sawdoctor, it would be great to recommend him to other swingblade mill owners. Most swingblade mill manufacturers sell retipping jigs. You can get pre-shaped and pre-tinned tips (with solder and flux on them) from them, to weld on yourself if you have a basic welding set. You’d need a jig or holding device that holds both your blade and your tip in place as they are carefully aligned. The tip and seat are heated to just cherry red, and the two brought together to set and cool. Basically you need to compare the cost of the jig and tips, versus the downtime getting your blades to a sawdoctor if the nearest one is more than a couple hours away! Getting the blade tips perfectly sharp makes the saw sing and cuts a pleasure. Lose the edge and you can get a whole lot of frustrated… Keep them sharp, they are a simple tool suited to excellent work. Could you please give me more information on the retipping jigs and where I can get one? Love to help, Rachel in parts will be emailing you some info today! Hi there 🙂 We don’t presently have a brochure for this but it’s something we’re working on. If you do have a specific upgrade/accessory/parts query, please feel free to contact us at: info@petersonsawmills.com and we’ll get back to you asap. Cheers, Layla. 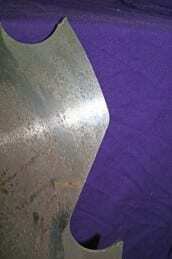 I am trying to locate a company in the midwest US (Wichita KS) that will re tip a swing blade sawmill blade. Hi Ed, thanks for that. I have forwarded your message to our USA Agents, Left Coast Supplies who will get in touch if they’re able to help with the contact details of a Sawdoctor near you. Cheers, Layla. Hi Layla. My Peterson blade, now over ten years old, requires reteething retoothing, anyway where can I find the specifications to give my saw doctor? It is a ten inch cut blade with eight mounting holes and four expansion slots, and six teeth.